Warren’s frustration was palpable—and not so hard to parse. When she launched her campaign for the Senate, she was a liberal darling, famous for mixing it up with Timothy Geithner in congressional hearings as an overseer of the tarp bailouts and for defending the victims of Wall Street excesses with a homespun directness rare among Democrats. Her cult following swelled with a viral YouTube clip in which she gave one of the pithiest defenses of liberalism by an American politician in recent memory. She has raised vast sums of money—nearly $25 million at last count, among the biggest hauls on record. Since entering the Senate, Brown has proved to be a remarkably agile politician—casting a symbolic vote against extending the Bush tax cuts while protecting the carried-interest loophole for investment managers; voting for financial reform, but not before weakening it at the behest of the banks who’ve given heavily to him. Still, he should be beatable in Massachusetts on the basis of one vote alone: the one he would cast to make Mitch McConnell majority leader of the Senate. And yet polls put his statewide approval rating at around 60. And yet Massachusetts’s current governor, Deval Patrick, hails from Chicago, while his predecessor, Mitt Romney, grew up in Michigan. In conversations with voters and longtime pols, I began to suspect the real problem was Warren’s celebrity— the checks she’d pulled in from Susan Sarandon and Oliver Stone; the fact that the source of her power wasn’t the state’s proud Democratic machine. Indeed, Warren has often struggled to find the right balance between her national profile and Massachusetts’s parochial politics. Her early ads cast her accomplishments in a soft hue, referring vaguely to an agency she'd created to “protect consumers.” “It made it sound like she was someone who rated kitchen utensils,” says Ralph Whitehead, a journalism professor at the University of Massachusetts. 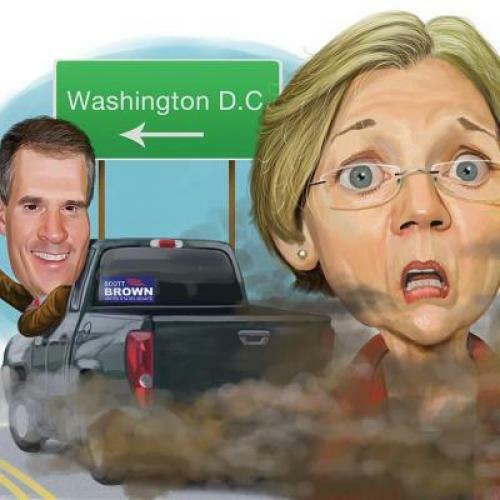 The campaign team, a combination of Massachusetts veterans and Beltway hands like Mandy Grunwald, recently rolled out a more effective spot featuring working-class residents praising Warren—in very thick Boston accents—for taking on the big guys. But Warren herself was practically absent from the ads. There may also be more subtle ways in which Warren’s most powerful arguments don’t play well in Massachusetts. Some of the banks that Warren has castigated Brown for protecting are major Boston institutions. And the preservation of Obama’s health care law seems less urgent in a state that already has its own universal coverage. When I made the rounds of the state’s Democratic old guard, I was surprised at how openly they disparaged Warren. Jim Shannon, a former Democratic congressman and state attorney general, told me, “At this relatively late point in the campaign, I don’t have a fix on what type of candidate she is.” Boston Mayor Tom Menino has conspicuously avoided endorsing her altogether. It wasn’t hard to understand Warren’s agitation. She had launched a campaign based on the Aaron Sorkin–esque notion that, if a candidate laid out the facts and made her argument with conviction, voters would see the light. Reality, of course, is messier. In Dorchester, she was being challenged for a concession that was hardly unusual, but that was undeniably jarring coming from someone running on such an explicitly moral platform. Even her knack for the impassioned monologue is now being used against her: Brown is running ads tying her famous YouTube riff (“There’s nobody in this country who got rich on his own”) to Obama’s garbled version (“You didn’t build that”). Alec MacGillis is senior editor at The New Republic. This article appeared in the August 23, 2012 issue of the magazine.